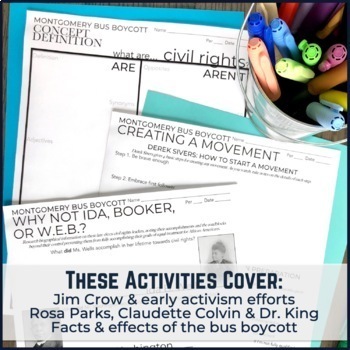 Tap into your students’ personal passions, the deciding factors of successful social movements, and an array of critical thinking skills in these 9 activities and project the cover the complete story of Civil Rights Movement's kick-off event, the Montgomery Bus Boycott by learning the contributions of everyone from Booker T. Washington and WEB Du Bois to Rosa Parks and Martin Luther King, Jr.
What made December, 1995 Montgomery, Alabama the time and place to start the Civil Rights Movement? Why did Rosa Parker cause such a stir and not Claudette Colvin? Who was this young preacher named King? What does this mean to your students now? 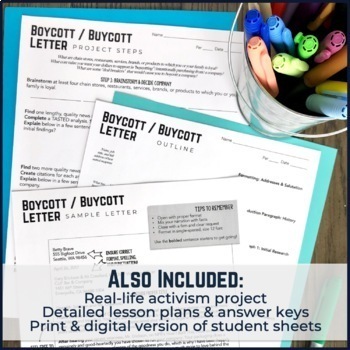 This low-prep activity 9-pack offers thought-provoking lessons that build towards students starting a boycott movement of their own of a company they patronize. Greatness is deliberately utilizing effective strategies to generate change. 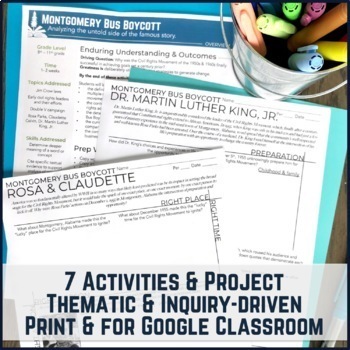 Challenge your students to investigate why Montgomery, Alabama 1955 was the perfect time and place and Rosa Parks was the perfect face for a movement looking for a catalyst. Culminate their learning with an authentic product for a real-world audience. Use as many or few activities you want; these are fairly interchangeable to match the classroom time you have! - Concept Definition notes to develop a nuanced understanding of the "civil rights"
- Research & rhetorical device analysis on Dr. Martin Luther King, Jr.
Want more Civil Rights Movement? 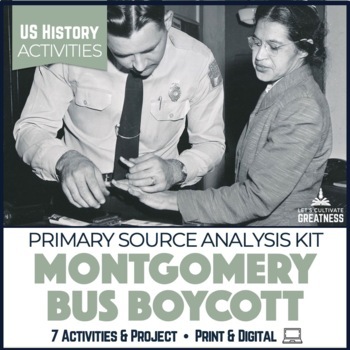 Want more engaging U.S. History activity packs? Great Depression: empathize with Dust Bowl survivors in 7 activities that analyze photos and personal letters. WWII Japanese Internment: empathize with Japanese Americans in 6 activities to analyze photos in order to create their own image. Roosevelts & Rockwell's Four Freedoms: dig deeper into the call to action against the growing atrocities overseas in order to connect art to real event. WWII Propaganda Posters: learn the techniques of persuasion in 6 activities in order to create own poster. Little Rock Nine: explore the balance of rights and responsibility by getting into the heads of key people involved in this front-page crisis in order to create a reflective poem.